The spice turmeric, rhizome of Curcuma longa plant has been used in our culinary preparation as well in medicinal preparations from ancient times. The spice is native to South Asia and belongs to ginger family. The active bio compound of turmeric is curcumin, a polyphenol which had covered the captions of almost all health magazines in recent years. The yellow orange polyphenol has a myriad of health benefits ranging from antibiotic, antiseptic, anti-inflammatory, antiarthritic, blood thinning, cardio protective and antidiabetic, antiageing, antinociceptive which have been proved by several human intervention trials. The recently touted property is the anticancerous potential of turmeric. Numerous studies have shown promising results in the use of curcumin as a potential agent to prevent and fight cancer by inducing apoptosis in the cancer cells but the bioavailablity of curcumin from the intestinal lumen is very less that it has been a hitch that decelerates the discovery of a nutraceutical from curcumin. Treating sprains and swellings with a pinch of turmeric powder is an age-old home remedy practiced throughout India. An effective home remedy for chronic cough and throat irritation is drinking milk boiled with a pinch of turmeric. A study in the Journal of Affective Disorders has showed noticeable and promising results with turmeric for supporting a balanced mood. 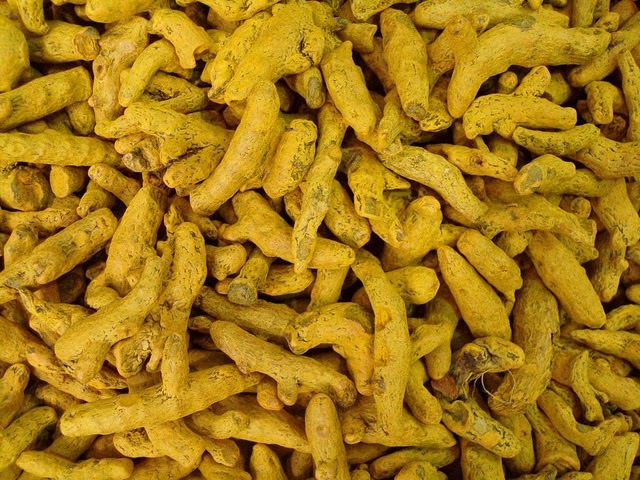 Apart from therapeutic uses, turmeric is used as a preservative, colouring agent, to marinate and as flavour enhancer in Indian curries and gravies. Turmeric is used by south Asian woman as herbal powder to get a radiant skin. It’s also sprinkled as a pesticide to ward off tiny insects in nook and cranny of our home. By drinking it as a tea or by using it in curries and gravies are two great ways of using turmeric. Turmeric tea is an easy way to supplement curcumin. Simply boil four cups of water, then add one teaspoon of ground turmeric and simmer for approximately 10 minutes. Strain the tea through a sieve and pour into a cup. Flavor turmeric tea by adding a little honey or lemon juice or coriander or mint leaf. Turmeric is a blood thinner and persons taking warfarin drugs should not consume additional doses apart from adding it in food. Some people are sensitive to the bioactive component tumerone which can result in abdominal discomfort and diarrhoea. Size of Gall stones may be aggravated by consuming turmeric orally. There are plenty of commercial turmeric powders in the market and be sure to buy one that is free from adulteration and from reputed companies for maximum efficacy. Why do we Season Foods?